Open source software projects may not typically have the marketing budgets necessary to match launch events like the one Microsoft just held for Office 2013, but that doesn't mean their products are any less valuable. Canonical surely came close in terms of hype with its Ubuntu phone announcement just after New Year's, but this week Black Duck Software brought a brand-new crop of open players to light. 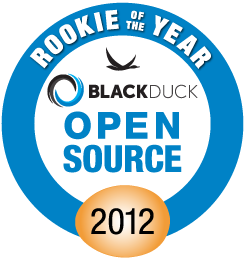 Following up on last year's list, Black Duck released its “2012 Open Source Rookies of the Year” on Wednesday, highlighting 10 key up-and-comers worth watching over the coming year. 1. Ansible, a configuration management, deployment, and ad-hoc task execution tool. 3. GPUImage, an iOS library that allows users to apply GPU-accelerated filters and other effects to images, live camera video, and movies. 5. InaSAFE, which produces realistic natural hazard impact scenarios to enable better planning, preparedness, and response. 7. Sidekiq, which provides simple, efficient message processing for Ruby. 8. Syte, a packaged personal site with social app integrations including Twitter and GitHub. 9. Twitter Bower, a package manager for the Web that aims to make it easy to install images, CSS, and more, including managing dependencies. Black Duck did also name an honorable mention, it's worth noting: DCPUToolChain, which is an assembler, compiler, emulator, and Integrated Development Environment for the DCPU-16 virtual CPU. At least as interesting as the above list of top picks, meanwhile, are the overriding trends Black Duck drew out of its data, which was drawn from Ohloh.net and the Black Duck KnowledgeBase with a weighted scoring system focusing on project activity, commits pace, project team attributes, and other factors.